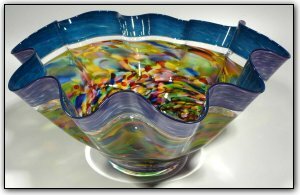 This absolutely stunning incalmo fluted bowl features 7 individual bands that together form this magnificent piece of art. Incalmo is an extremely complex technique where each section is made separately and then they are joined one at a time while the glass is still hot. There are 3 clear bands, 2 aqua/purple bands, and 2 End Of Day® bands meaning they were made with a variety of colors used throughout the day and contain nearly every color in the rainbow. Also notice that the aqua bands on the inside are purple on the outside. Everything about this bowl, from the colors to the flutes to the form, are nothing short of perfection.